I’m sure we have all worked with someone who misses deadlines, is uninterested in the job or who is regularly late or absent. This can cause problems in the workplace and affect performance of a team. Often when an employee is disengaged there is a reason. It may be because the employee has been bereaved, is going through divorce, their child sick or they are suffering from depression. Alternatively it could be because they are unmotivated, feel bullied or are suffering stress. 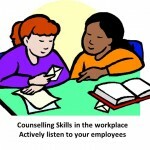 It is essential that employers support these employees by using different counselling skills rather than thinking of ways of getting rid of them. Managers need to accept that employees can have issues at home which can be brought to a work place affecting an employee’s performance. Identifying them and helping an employee is a more helpful way of ensuring they are happy within their workplace. Managers need to think about helping their employees turn around their performance by offering support and using counselling skills. Actively listening to an employee and putting the right actions into place to support them, will overall improve an employee’s work performance as well as ensure they feel valued. It will also mean employees will feel supported rather than ‘got at’. Counselling an employee is not just about having one to one meetings in a formal setting but it is about going through a counselling process. You need to help them identify that a problem exists and throughout all meetings you need to be open minded. Do not ask aggressive questions but use open ended questions that encourage discussion. Paraphrase back to the employee what you have heard to show that you are listening. Try to put yourself into their shoes and recognise the feelings that they are experiencing. Make sure you give the employee a chance to tell their story. Do not interrupt. Most importantly, learn how to use silence. This allows employees to fill in the silence with the information you need or give them a chance to talk. One to one meeting are important but it is also about using counselling skills with the employees when they are with their working environment. You need an employee to feel they are part of a team rather than making them stand out. Use phrases such as ‘I am wondering’ or ‘I hear’. Most importantly do not judge them. Don’t call them losers or lazy etc. Managers need to get the employee on their side and the only way in achieving this is by listening to their employee. If an employee feels that there is trust, respect and their feelings are valued then they will be more agreeable that there is a need for change. Once the employee is in agreement for change you need to help them identify what the problem is. If the problem is due to a personal matter out of the workplace or stress and you feel you do not have the time or skills to deal with the problem, you may wish to consider offering them professional counselling. After you have identified the problem, you need to agree on specific actions that the employee will take to improve their performance. Give the employee a chance to identify their own solutions and to share their feelings about how it will be implemented. This needs to be regularly followed up to ensure the employee is reaching the goals but also they know you are there supporting them. It is important during this stage that you identify the employee’s good performance. This ensures they continue the correct behaviour but it helps them feel valued within the workplace.